The Remote-Control Owner - AutoInc. Would you like to have more time away from your shop to pursue other interests? See what some of your peers have to say about this surprisingly polarizing question. One shop owner I talked with said he had a great team that could run his business without his physical presence. He already has begun working remotely, though he’s stayed active in the decision-making process. Over the previous five years, he had pursued his goal to create a shop environment that would allow him to spend significant time away so that he could have a more balanced family life. But he also wanted to ensure that the business continued to represent the core values he had originally set out to achieve. Now, he believes, the true test of a well-run business is a structure that can support an owner’s decision to work elsewhere. Maybe you have a similar goal in mind. If so, there are three key questions you must ask yourself before starting. And after you’ve candidly answered the questions, you can then determine how to build your business so that it does not require your constant presence. What tasks can only be performed by you? These responsibilities usually focus on setting your company’s vision and objectives. You’re the one who is ultimately accountable for laying the foundation for success, which means you must set the company’s direction. You cannot delegate this responsibility. How can others help you implement your vision? You can never fully disassociate yourself from your business. However, you must build a team that can implement your vision. If you set clear and compelling mission, vision and values, your team can build on this foundation to create their action plan. How can I let people do their jobs? If you’ve hired a strong, talented and flexible team and have provided clear objectives, you have to be willing to allow them to get things done as they see fit. Because your time and creative energy are limited, concentrate on building your business and let your team handle the daily details. It’s not easy to trust others to maintain what you’ve created, but it’s necessary if you want to pursue other interests. Shops that grow and prosper all seem to have one thing in common: owners that are comfortable letting the business work without their involvement in all operations. Agnes Perez, a peer of mine at the Automotive Career Development Center (ACDC), is also a partner in Auto Air Parts (AAP) in San Juan, Puerto Rico. AAP is a major distributor of air conditioning parts for Puerto Rico and the rest of the Caribbean. Ellen Barnes Pfiffner, CEO of Dallas-based EBP Consulting, a company focused on family run businesses of all sizes, notes that many of those shops do rely heavily on the owner for daily operations. Customers get used to speaking directly to the owner for pricing and other information, and employees are dependent on getting answers from the boss. Those astute owners embrace three key practices, Pfiffner says. First, they take the time to make good hiring decisions. If they do make a bad decision, they rectify it as quickly as possible. Second, they invest in technician training and empower their team members to make decisions and perform the business’s essential daily functions without the need for constant direction. And third, savvy shops have written standard operating procedures (SOPs), a set of current, step-by-step instructions that employees can refer to when the owner is not available. Owners that adopt those three practices often have shops that run smoothly and profitably for periods of time without them. Most importantly, those standards give them the liberty to pursue other activities and interests for a more rewarding and balanced life. David Friend, owner of Mobile Tech in Wilmington, N.C., owns two locations. He’s also the host of a future ACDC class. So when I recently visited with him about this issue, asking the same questions I mentioned at the beginning of this article, he was forthcoming. “Yes, I think my business should be able to run without me, but I’m not quite there yet,” he said. “My second location is only a year old, and it’s not ready to stand on its own. But I’ve developed two procedures that help me better manage remotely. “One, to schedule appropriately for times when I’m away. Two, what I call a Daily Download. At 3 p.m., everyone at the shop participates in a group text. This way, everyone gets updates at the same time so they can address any issues and make plans for a productive completion of the day. Another key ingredient of establishing a work culture that doesn’t require an owner’s presence is developing a “growth mindset.” This business concept is spelled out in a book by Stanford professor Carol S. Dweck, titled “Mindset: The New Psychology of Success.” Briefly, here’s how it applies to the topic at hand. A growth mindset, on the other hand, allows you to see new ways of doing things, see new opportunities to learn and take on new challenges to grow and, ultimately, benefit from change. For example, Phil Greene, manager of Chapel Hill Tire in Carrboro, N.C., says that it’s important to have an operation that can run without him. And what creates this business model, he says, is the culture of his company. “This is mine, and I’ve worked toward having it be a great family business,” he explained. “Our son works for us, and we would like him to take over when the time is right. But we designed our business to have our family be front-and-center. Our customers love it, and this model has served our family values. Lasley, like some other shop owners I spoke with, was clear about favoring his familiar business model. 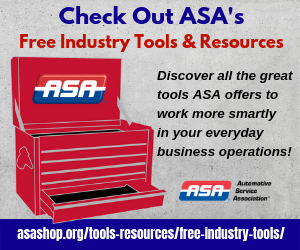 And because shops of all kinds and sizes hold membership in ASA, I recognize that despite business trends, which come and go, the approach that works for you in your shop is the right approach. 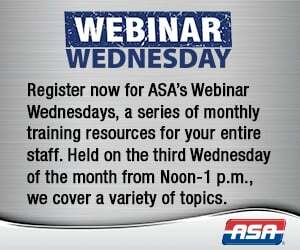 If change is what you need, though, it’s available from many sources: through 20 Groups, business coaching, your local Chamber of Commerce and, of course, ASA-National’s annual training events such as the MSO Symposium and Advance Technology & Diagnostic Repair Forum at NACE Automechanika, CARS@AAPEX and from many of ASA’s Affiliates’ regional training and networking opportunities. Still, experience has proven that it’s most often best to put yourself in a position to run your business instead of it running you.